Yoav Perlman - birding, science, conservation, photography: Eagles & poisoning! This morning I took my time to avoid rush-hour into Tel Aviv, so I went for a quick look near Hulda, not far away from my house. Many eagles were seen there yesterday, so I hoped to get some images of them before the big weather system that should hit us during the next few days (first thunderstorms at the moment!). As I got to the specific field, I noticed several raptors feeding on the ground in different parts of the field. 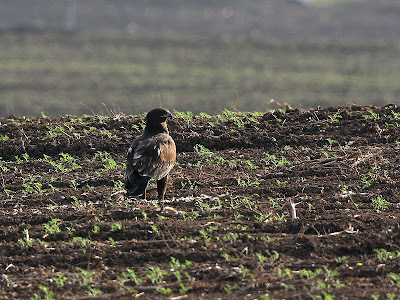 Immediately I saw 2 Greater Spotted Eagles, 1 Steppe Eagle, 1 Imperial Eagle, several buzzards, many kestrels, and a juv. Peregrine, all feeding intensively on skylarks. 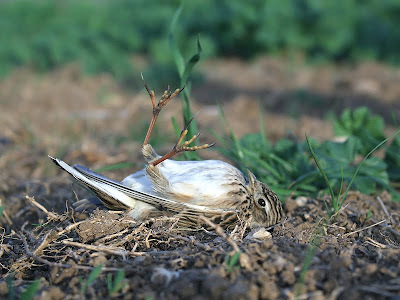 As I drove around the field, I noticed a few skylarks that showed signs of poisining - they didn't fly properly, stumbled and fell when walking, dropped their heads etc. I met the local farmer who told me that he used Alpha-Chlorlose - a nerve poison against skylarks causing damages to his chickpea field. He used the poison according to his permit. This is another example how the laws for use of poisons in Israel are twisted and out-of-date. I called the local NPA warden; together we patrolled the field, chased raptors away and collected dead or dying skylarks. I had to leave before noon but the ranger stayed there to complete the job. Hopefully the rain that is pouring at the moment will wash the poison away. At the moment no raptors with secondary poisoning were found, and I hope it stays like that. Anyway we will patrol the area to search for poisoned raptors tomorrow. The total number of eagles for the morning was 4 greater spots, 2 imps and 1 steppe, which is a good winter bird for this region. Two Hen harriers are worth mentioning too. A brief scan across the adjacent reservoir produced about 60 white-headed Ducks, 10 Ferruginous Ducks and 50 Black-necked Grebes. 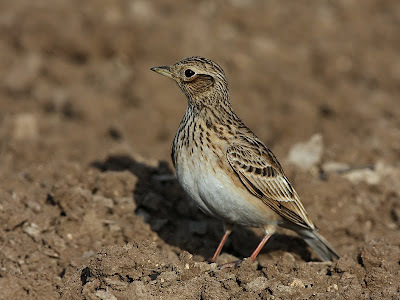 This is one of the poisoned skylarks. I took it home and later it came back to life. I released it in the afternoon.